Welcome! The material in these pages is presented for your enjoyment as well as to inform. I am an educator by profession, and the purpose of this page and all the associated links is to educate, both the pigeon fancier and the non-fancier. So I hope you have a pleasant time visiting this page and all the linked sites; and I hope that when you leave you will be more knowledgeable regarding the species, Columba Livia, than you were prior to your visit. Enjoy! I am a member of the American Racing Pigeon Union, the West Central Ohio Flyers, the Findlay (OH) Racing Pigeon Club, the National Pigeon Association, the American Giant Homer Association and the American Dragoon Club. I am a charter member of the American German Beauty Homer Club. I am a former member of the Fremont Pigeon Club, the Rare Breeds Pigeon Club, and the American Frillback Club. 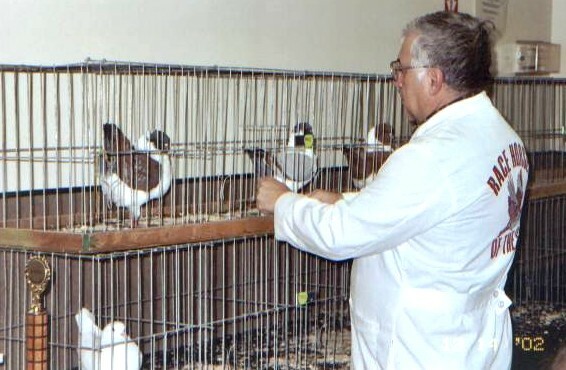 I have judged pigeon shows throughout the eastern half of the United States, and I still accept judging assignments on occasion, both as an all-breeds judge and a judge of some specialty club meets. Some of the venues where I have judged pigeon shows include the NPA Nationals in Birmingham, Alabama and Detroit, Michigan; the National Young Bird Show in Louisville, Kentucky; the Kentucky State Fair; Indiana State Fair; York, Pennsylvania; Bay City, Detroit, and Holland, Michigan; Hammond, Indianapolis, Muncie and Hartford City in Indiana; Tulsa, Oklahoma; Fremont, Cincinnati, and Akron, Ohio; as well as several county fairs in Ohio and Indiana. In 2009 I took a year off from judging, but I served as the all-breeds judge at the Fremont Fancy Pigeon Show in January of 2010 and also judged the September 2013 young bird show. In June, 2011, I was recognized as a Racing Homer judge certified by the American Racing Pigeon Union. Some of the individual breed meets that I have judged in the past include Racing Homers, American Show Racers, Dragoons, Pouters, German Beauty Homers, Frillbacks, and Giant Homers, as well as certain of the rare breeds. In 2016 and again in 2017 I was the sole judge of the American Giant Homers at the National Young Bird Show in Louisville, KY, and in December of 2017 I was one of the judges at the inaugural "Top of Ohio" pigeon show in Bellefontaine, Ohio, followed by an assignment as the all-breeds judge at the Fremont, Ohio, pigeon show in January of 2018. For the 2019 show season I will be judging the Racing Homers at the National Young Bird Show in Louisville, plus a federation racing homer show in Akron, Ohio in November and working as a general judge at the 2nd annual "Top of Ohio" show in Bellefontaine, Ohio in December. I am above all a hobbyist, not a dealer. I keep pigeons because of my love of the species for their beauty and in the case of Racing Homers for their athleticism and intelligence, and also because of my interest in genetics, particularly color genetics. Does this mean I do not sell pigeons? No. I do sell surplus birds on occasion, but I am not in it for the money (although an occasional sale certainly does help cover the feed bill). I sell my surplus at prices other hobbyists can afford. (Click here to see what I do have available at this time.) I also on occasion supply "white doves" (actually white homing pigeons) for use at weddings and other special occasions in the area. I also supply my daughter with whites for her wedding-release business, which supplies releases in the Central Ohio region. Our whites, however, are top quality racing pigeons, not just white birds kept for special events, and they must fly with the rest of the race team in order to earn a spot in my loft. Several of our whites have won diplomas for us. In addition to my pigeon interests I am a licensed auctioneer in the state of Ohio. I am now available to conduct auctions in both Ohio and Michigan, and I would love to do the bid calling at your club benefit auctions in either of those states. In June of 2009 I retired after 41 years as a high school mathematics teacher, the last 39 of which were spent at Lima (OH) Central Catholic High School as teacher, department head, and resident curmudgeon. I am currently working part time as an instructor in mathematics and statistics at Ohio Northern University in Ada, Ohio, where I have been employed since 2001. Contact us for your auction needs.